Gingerbread is made from brown mohair. She stands 9 1/2" tall. Her eyes are black glass. Her nose is red perle cotton. 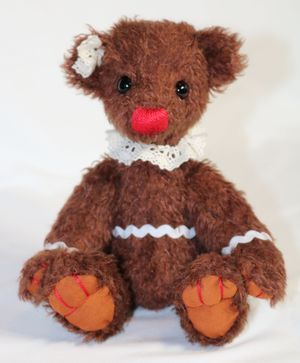 Gingerbread has beige ultra suede for her paws and foot pads with pulled paws and toes. Her face is scissor sculpted. Gingerbread has rick rack around her arms, legs and tummy. She is wearing a lace necklace with a lace flower in her ear. gingerbread is 5 way jointed and is stuffed with poly-fil. 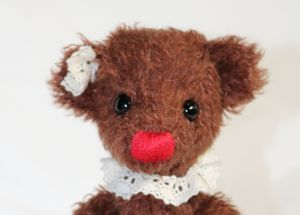 Gingerbread can be adopted for US$40.00 + shipping. Please click on the down area for shipping in your area. Thanks.